The Brazilian authorities have launched an operation to combat illegal gold-mining on the land of the Yanomami tribe. ‘Operation Korekore’ is set to last 30 days and aims to arrest approximately 200 illegal miners who are operating in one part of the tribe’s territory. The operation’s ground squad has reportedly destroyed at least 20 illegal mining rafts and one airplane landing strip so far. The Yanomami live in the Amazonian rainforest in northern Brazil and southern Venezuela. They depend on their forest for food and shelter and have voiced their outrage at the miners’ invasion. But despite the Yanomami’s appeals, many miners continue to operate on their land, destroying the forest and polluting the rivers with mercury. 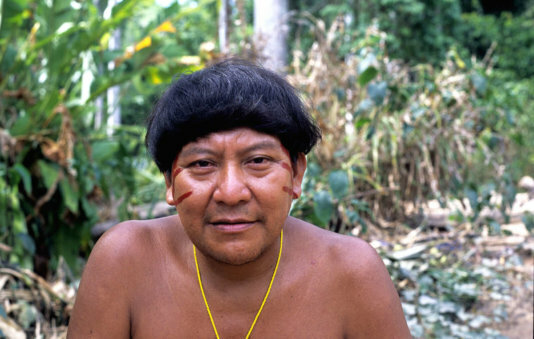 The uncontacted Yanomami are particularly vulnerable to the diseases transmitted by the miners. Last month the Yanomami protested over the lack of medicines and health care, forcing the Ministry of Health to change the official in charge of indigenous health care in Roraima state. For decades, the Yanomami have been exposed to violence at the hands of illegal miners. 2013 marked the twentieth anniversary of a gruesome massacre in which sixteen Yanomami were killed. Last year, several groups of miners were removed from Yanomami land, but hundreds more remain, putting the Indians’ lives at risk. A draft bill currently being debated could permit large-scale mining on indigenous land and bring further destruction. There over 650 requests from mining corporations to mine in the Yanomami territory. Yanomami shaman Davi Kopenawa said, ‘This will not bring anything good for the Indians. It will only bring many problems, many diseases, and many bad people who kill Indians’. Survival played a key role in bringing about the demarcation of the Yanomami’s land in 1992, and is now calling on Brazil to remove all the illegal miners once and for all, and to scrap the mining bill.